Two notable new 20,000-ton ferries are in the process of beng placed into service between Bergen, Stavanger and Hirtshals in Denmark, with a day voyage back to Langesund. They are notable as they are the first important passenger ships in the world to depend solely on liquified natural gas (LNG) for fuel. With the imposition of a new 0.1% sulphur limit within the Emission Control Areas of Europe amd North America in 2015, cruise ships are sure to follow, as LNG means lower emissions of CO2, Nox and Sox. In Ancona last week, Fincantieri delivered the third in its series of 10,950-ton niche cruise ships to Compagnie du Ponant. Meanwhile, in Hong Kong preparations go ahead for the opening of the new Kai Tak cruise terminal to serve the Chinese cruise market from this October. Royal Caribbean, who have a 20% interest in Kai Tak, expect to carry 200,000 Chinese on their own ships this year. For a good part of the 20th Century the Norwegian American Line ran a Transatlantic service. Their last ship, the 24,492-ton Vistafjord, is now in her last year of service with Saga as Saga Ruby, before being retired in 2014. 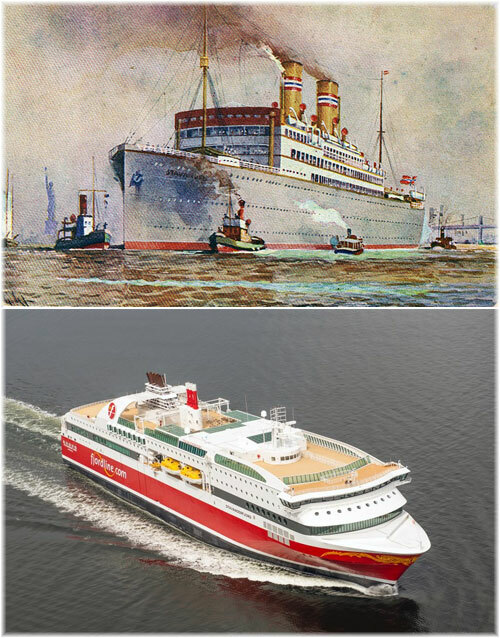 One of the Norwegian American fleet, the 12,997-ton Stavangerfjord, held the record for the North Atlantic liner with the longest continuous service under the same name and same owners, having been built in 1918 and retired in 1963, for an extended career of forty-seven years. Even Queen Elizabeth 2, with a career stretching from 1969 to 2008, did not quite achieve a full forty years. On the other hand, the 18,739-ton Bergensfjord, second of that name, became the French Line’s De Grasse in 1971 and then the Rasa Sayang, before being lost to a shipyard fire at Perama in 1980. This year, Norway’s Fjord Line has revived the names of two of the old NAL liners, with the 20,000-ton sister ships Bergensfjord and Stavangerfjord. Each will carry 1,200 passengers (1,500 by summer) in day and night service between Bergen, Stavanger and Hirtshals in Denmark, as well as offering a day service between Hirtshals and Langesund, in southern Norway. The voyage between Bergen and Stavanger takes between seven and eight hours and that between Stavanger and Hirtshals between nine and twelve, depending on the schedule, while Hirtshals to Langesund is a four- to five-hour daytime passage. These are not cruises by any means but the longer passages and round voyages do allow Fjord Line to call their new ships cruise ferries. Probably the most interesting aspect of these new ships is that they are the largest passenger ships yet to be fueled solely by liquid natural gas (LNG). They will be supplied with 30,000 tons of LNG per year at a new fueling station in Risavika, just 300 metres away from their normal berth in Stavanger. By using LNG as fuel, the two ships are able to reduce their CO2 emissions by 15%, NOx by 85% and SOx to practically nil. LNG fuel is also very clean, producing very low particle emissions, no visible smoke and no sludge. With the imposition of the new Emission Control Areas throughout Europe and North America and Europe, which will reduce the maximum sulphur content to 0.1% in 2015, there is now a move towards considering LNG as a fuel for cruise ships as well. There are problems however. While LNG may be cheaper, its volume is 1.8 times that of diesel fuel, and with the necessity of using highly-insulated cylindrical tanks, the space required for bunker storage is almost four times that required for conventional square fuel tanks. Availability is another problem, but ships sailing within closed systems or on repetitive itineraries should be able to cope easily. Shell is in the forefront of LNG supply and in addition to investing in the first two LNG-powered Rhine barges in Europe has signed an agreement with the Interlake steamship Company on the Great Lakes to supply its fleet of bulk carriers with LNG fuel from a new facility at Sarnia, Ontario. Initially, it had been intended to investigate LNG as a fuel for Viking Cruises but they will be built for propulsion by conventional fuel. Fjord Line’s Stavangerfjord entered service in June and Bergensfjord is due to join her later this month. These two are not the first large LNG-fuelled ferries however as Viking Line introduced the dual-fuelled Viking Grace this February. With 880 passenger cabins, this 57,565-ton night ferry has been running between Stockholm and Turku via Mariehamn, using diesel fuel until the bunkering system at Stockholm could be completed. While Norway’s Bergen Group Fosen built Stavangerfjord and Bergensfjord on hulls built at Gdansk, Poland, the Viking Grace was completed by STX Europe in Turku, Finland. 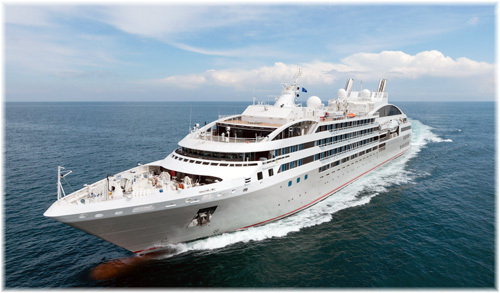 Fincantieri delivered the third of three 10,950-ton luxury cruise ships to Compagnie du Ponant. Le Soléal, which was delivered at the Ancona shipyard on Friday, is a unique mega-yacht, niche and adventure product and will be the line’s new flagship. Designed to offer her 264 passengers different experiences, she is able to reach destinations around the globe inaccessible to larger vessels. The new French-flag ship is 466 feet long and 59 feet wide. Her 132 cabins and suites all have a sea view and 94% have a private balcony. As with sister ships Le Boréal and L’Austral, Le Soléal has been built to ice class for navigation in polar and sub-polar regions. been designed for the first time by Fincantieri, with products and craftsmen selected by a special in-house team. The new ship also has a slightly lighter hull colour and higher installed power to allow more flexibility in cruise planning. Marseilles-based Compagnie du Ponant now operates three sister ships targeting the luxury market, plus the original 60-berth Le Ponant. Founded in 1988, the company is today a member of the UK-based Bridgepoint Group. On June 12, Hong Kong’s new Kai Tak cruise terminal, built where the old Kai Tak Airport operated until 1998, ran a trial with the arrival of Royal Caribbean International’s 137,276-ton Mariner of the Seas. Along with sister ship Voyager of the Seas, these 3,114-berth Royal Caribbean ships are both now based in the Far East for part of the year. At the time of her test call at Kai Tack, Mariner was on a cruise from Singapore to Shanghai at the time. The terminal is due to open officially with the arrival of the Voyager of the Seas in October, followed by the Diamond Princess, and the Celebrity Millennium in December. Like the Mariner of the Seas in June, the Celebrity ship also conducted a trial call in March. 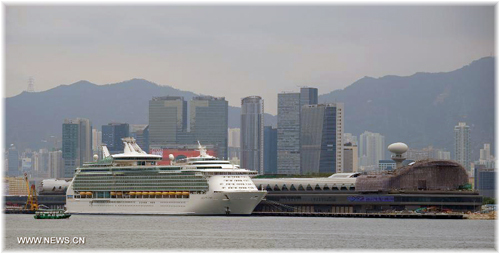 The Mariner of the Seas will also spend a short season based in Hong Kong this autumn. Nine chips now have reservations to use Kai Tak. Hong Kong’s existing Ocean Terminal, located in the Tsim Sha Tsui area of Kowloon, will continue to serve smaller cruise ships, but the new terminal has been opened in anticipation of an expansion in the near future in the Chinese cruise market. And while the Queen Elizabeth 2 called there every year on her world cruises, larger ships such as the Mariner and Voyager are unable to berth at the Ocean Terminal. Parent company Royal Caribbean Cruises Ltd has a 20% interest in the new Kai Tak terminal. Local Royal Caribbean executives confidently expect that within three years China will take first place away from the UK on the list of Royal Caribbean cruise markets outside the US. It is expected that 200,000 Chinese will cruise with Royal Caribbean this year, double the number carried last year.